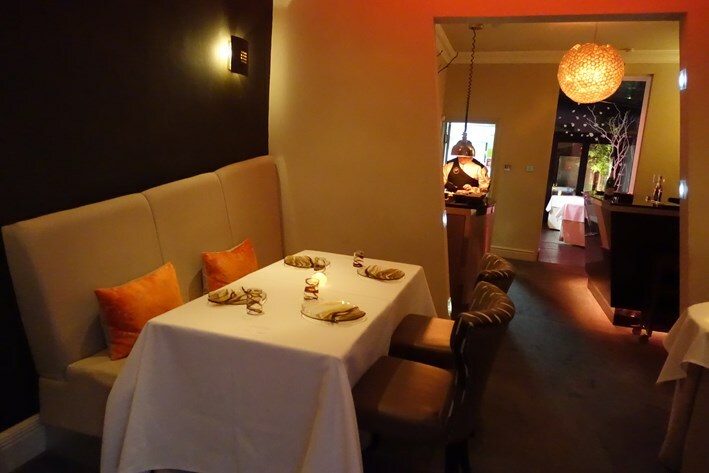 Marc Wilkinson’s tiny restaurant in Oxton near Birkenhead has just five tables, serving up to 16 customers, and opened in 2004. 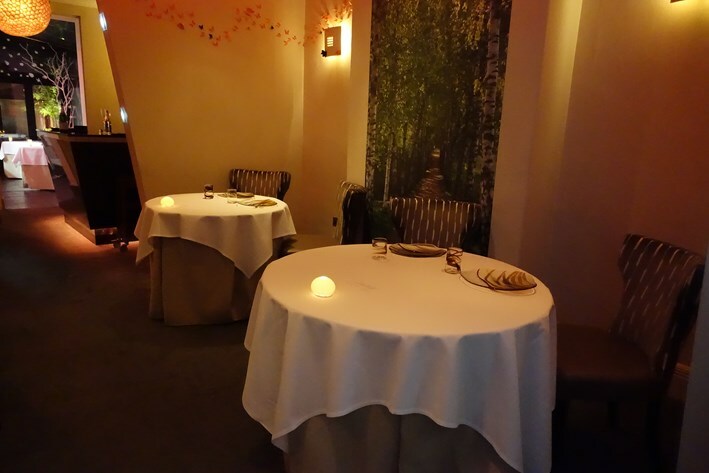 Despite its seemingly out of the way location it has held a Michelin star since 2007, and is nightmarishly difficult to book. 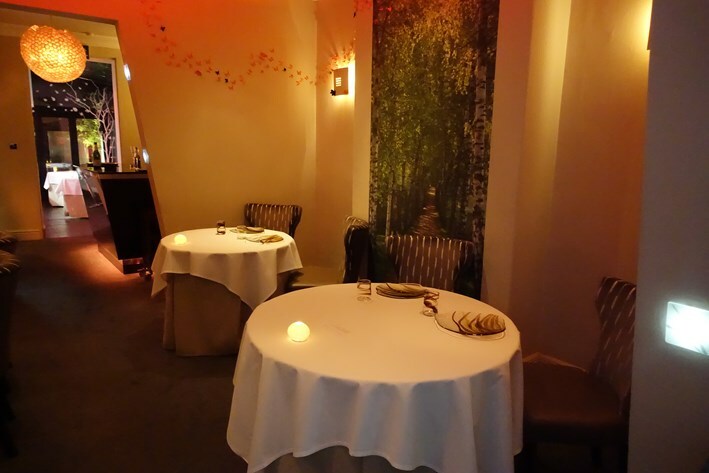 Mr Wilkinson trained at the Chester Grosvenor, Pennyhill Park in Surrey and The Mirabelle in Eastbourne before going out on his own at Fraiche. In this case he really is on his own, as he operates a solo kitchen. This is a restaurant rarity, other examples being the Crown at Burchetts Green, La Merenda in Nice and Daniel Baehrel in upstate New York. 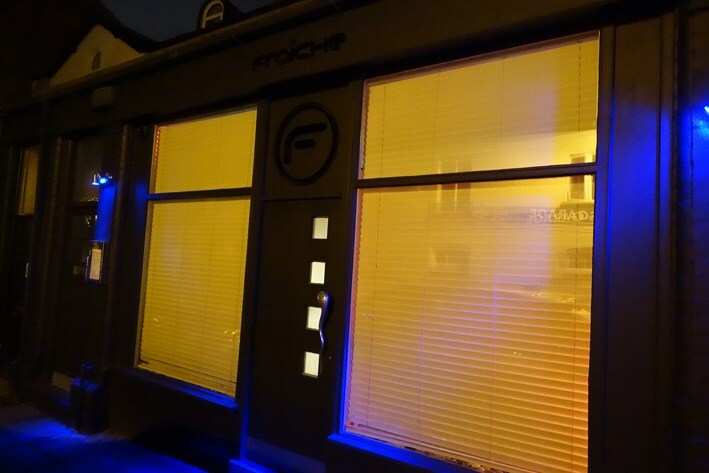 Fraiche has a lounge area where you can have a look at the menu and wine list and enjoy some nibbles. The dining room is divided into two sections, one with three tables, and a further section with then remaining two tables further on, next to the kitchen. 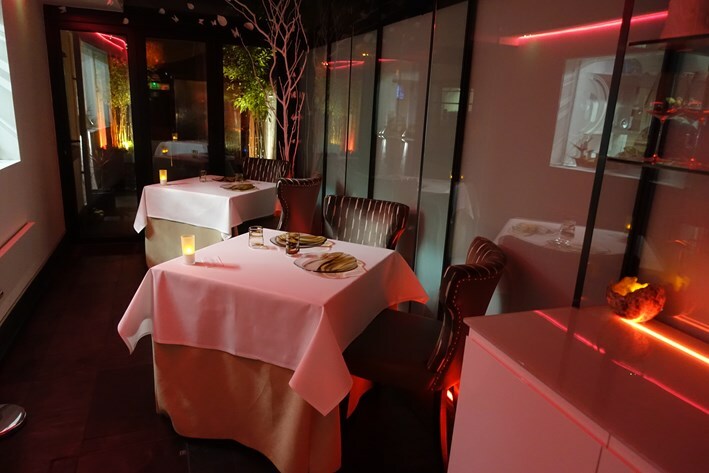 There is a video screen in the lounge showing assorted background scenes, and a selection of music chosen by the chef plays during the meal, but at a sensible volume. The music this evening moved through Carole King and Gladys Knight through to Sade, Jessie Ware and more. The lighting in the room was quite murky, hence the matching photos. 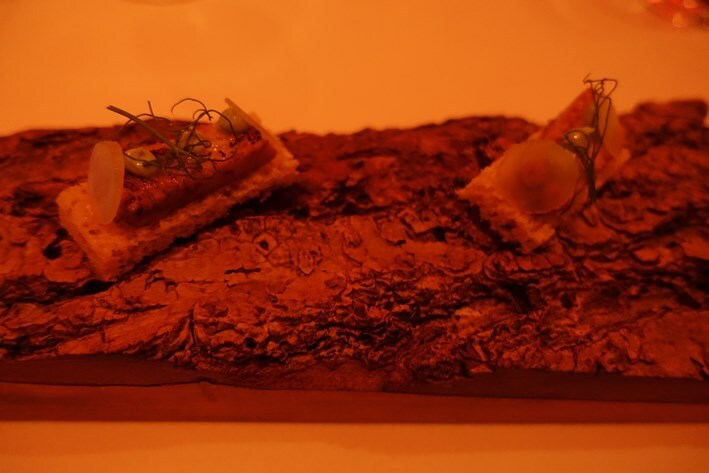 The menu cost £88 and was a fixed tasting menu. Nibbles were some toasted spiced pecan nuts, followed by a cheese jelly with yuzu and sourdough, then a tomato and feta mousse. These were all very pleasant, the mousse having smooth texture, the cheese jelly an interesting idea that worked well (15/20). The wine list had around three hundred labels and started at £24. Sample references were Bouchard Finlayson unoaked Chardonnay 2016 at £30 for a bottle that you can find in the high street for £13, Kumeu River Hill Vale Chardonnay at £54 compared to its retail price of £45, and Shafer Vineyards TD9 2015 at £90 for a wine that will set you back £61 in the high street. For those with the means there was Moret-Nomine Montrachet 2006 at £360 compared to its retail price of £300, and Mouton Rothschild 1983 at £435 for a wine whose current market value is actually more than this at £473. There were some real bargains tucked away in the recesses of the iPad in the upper end of the list, such as Comtes Lafon Meursault Le Barre 2011 at £145, barely above its current retail price of £134, of which we took advantage. This was a lovely wine list with high quality growers, some mature vintages and, above all, very fair prices. At the table a further amuse bouche was smoked salmon from the Severn Wye smokery in Gloucestershire, who supply Harvey Nichols and Harrods. 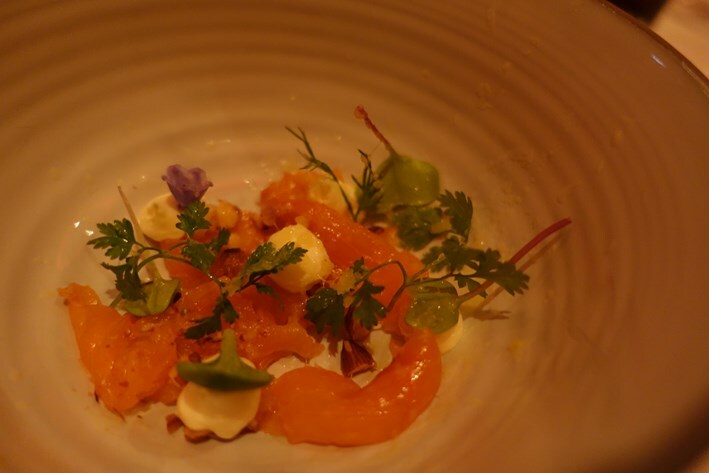 The salmon was combined with bergamot cream, pineapple and smoked almonds, the latter giving a nice contrasting texture, while the potentially dominant bergamot flavour was well controlled (15/20). Even better was smoked eel with apple and a lovage emulsion on brioche toast. Eel and apple is a classic combination as the acidity of the apple cuts through the richness of the eel, and the hint of sweetness from the brioche worked well. The brioche itself had lovely texture, and the eel had excellent flavour (17/20). 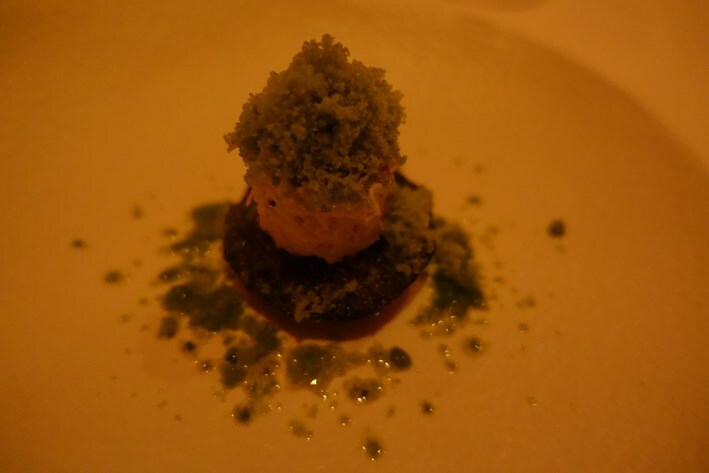 The first formal dish from the menu was crab with finger lime, squid ink crisp, pickled radish, compressed avocado and basil granita. This sounded potentially over complicated when it was described, but the balance of the flavours was spot on. The delicate crab went well with the avocado, and the acidity of the lime and vinegar from the pickled radish nicely balanced the richness of the avocado, the crisp delicate and bringing an extra texture. The basil worked surprisingly well, and this was a very carefully composed dish that suggested to me that the chef has an excellent palate (17/20). 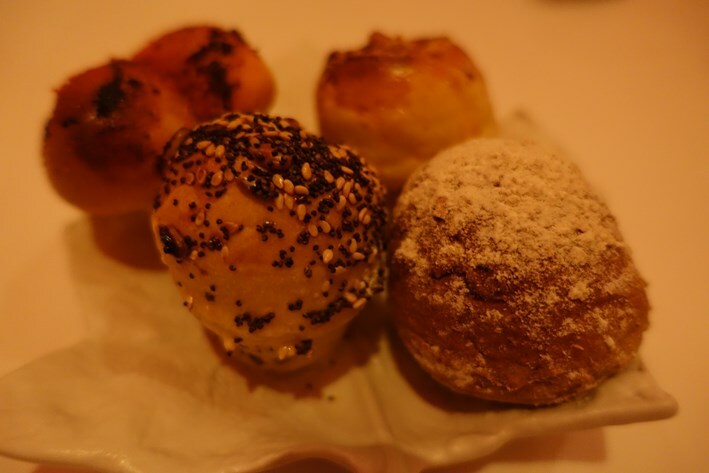 At this point a quartet of bread rolls arrived, all made from scratch in the kitchen and served warm. Mixed seed bread was good, as was granary bread with treacle, but I particularly liked both the tomato bread and the cheese bread roll, made with cheeses including Mrs Montgomery cheddar and Fourme d’Ambert. All had lovely texture, and the various flavours came through well (17/20). Consommé of shiitake had deep mushroom flavour, coming with chanterelles, hazelnut and nashi pear (an east Asian pear). 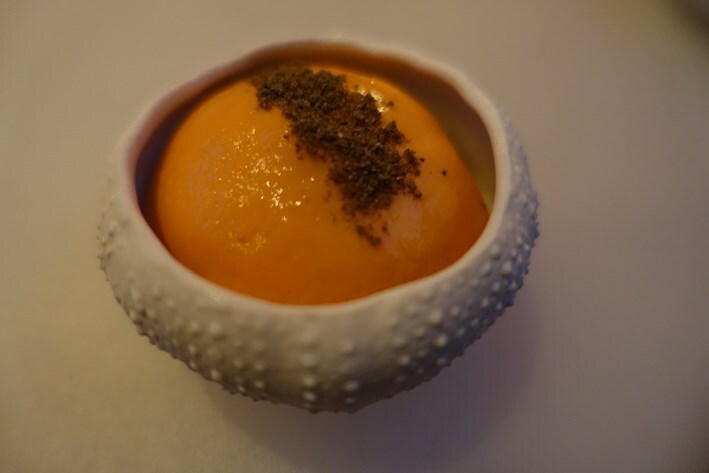 This was another enjoyable dish with plenty of umami (16/20). 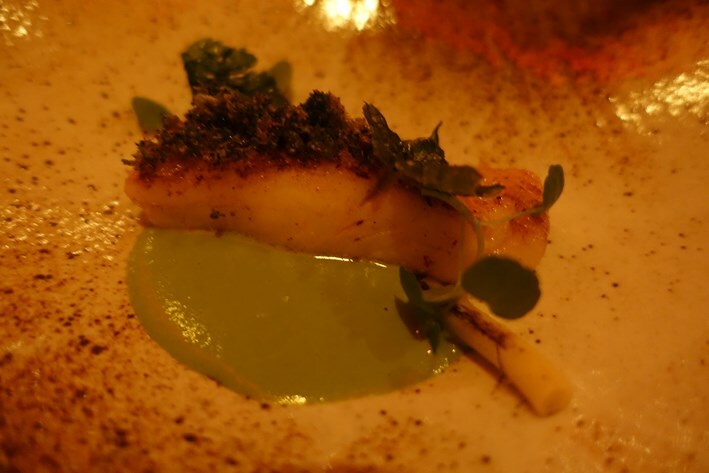 Cornish brill came with watercress sauce, fried broccoli and a parsley crisp. This was a terrific piece of fish cookery, the brill beautifully cooked and working really well with the other elements. This was a relatively simple dish but the quality of the brill combined with the skill of the cooking really made this stand out (18/20). 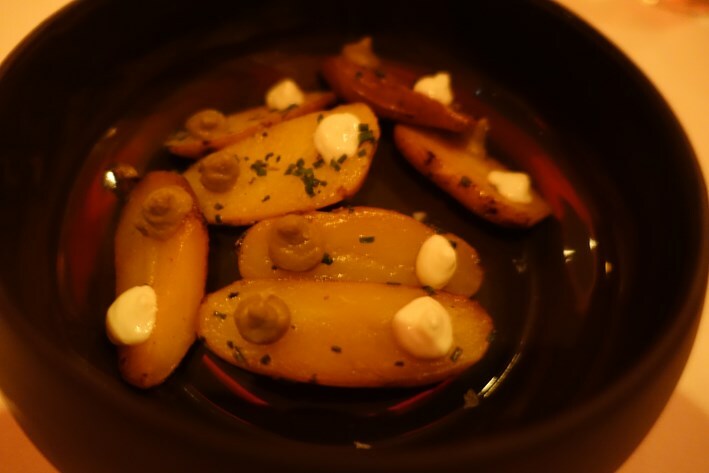 Unusually, there was now a little intermediate course of pink fir potatoes with green olives and buttermilk. The potatoes, which I believe were grown locally, had very good flavour, and worked nicely with the olives (15/20). My main course was quail from the Loire valley. 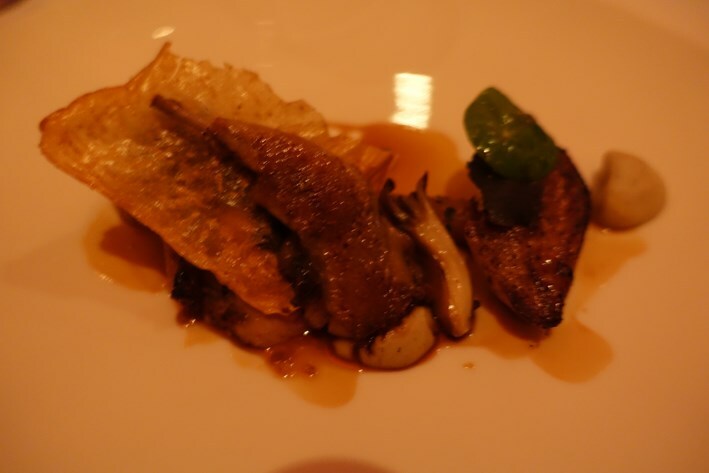 The breast was roasted and came with celeriac crisp, celeriac puree flavoured with truffles, maitake mushrooms, salsify braised in Madeira, sweet and sour beetroot and nasturtium leaves. There was quite a lot going on here, but the earthy celeriac went well with the delicate flavour of the quail, the pickling juices of the beetroot nicely balancing the richness of the meat (16//20). 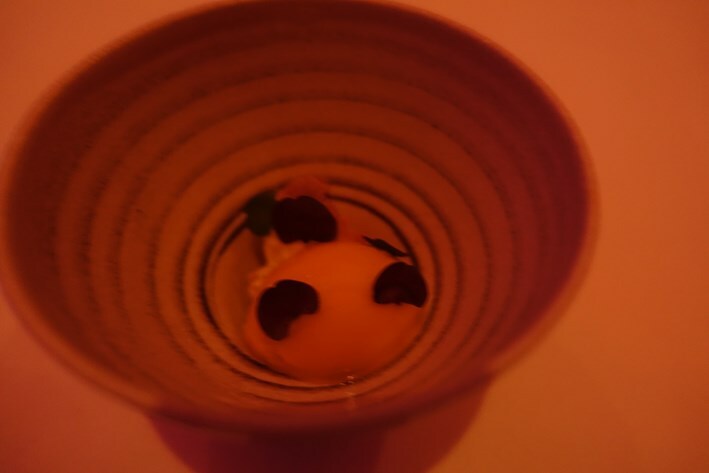 A selection of five cheeses each came with a matching condiment, and then there was a pre-dessert of apricot sorbet with lemon verbena ice cream, puffed rice and shiso leaf, which was pleasant and refreshing (14/20). Dessert featured pears in various forms. 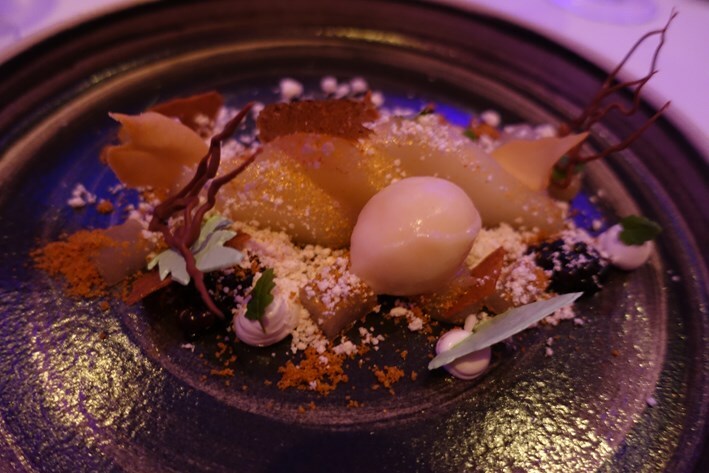 There was compressed pear with yuzu, poached pear, pear gel with vanilla, pear mousse along with beurre noisette powder, brique pastry, pastry leaves, blackberry, pandan (an aromatic Asian leaf) meringue, speculaas (Belgian biscuits) and chocolate branches. As you can see, there was a lot happening here, but the main combination of pear and chocolate is a classic one, and the other elements each brought something to the dish (15/20). Coffee was from the ManCoCo roaster in Manchester, and was very pleasant. Service was excellent, our waiter/manager having worked here for five years and being very attentive and knowledgeable about the menu. The bill came to £281 each, but that was due to some exploration of the wine list. The food element was £88, and if you shared a modest bottle of wine and added coffee and water then a typical cost per person might come to around £125 per person all in. This seems to me quite fair given the high standard of cooking here. Overall I very much enjoyed Fraiche and would definitely recommend it. It turns out that the restaurant will be closing in December 2018, though Marc has plans to reopen in a different venue in due course after a break.